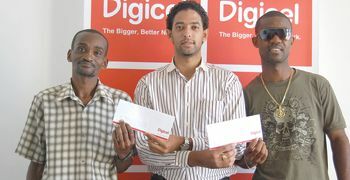 Three Digicel customers will have a bigger, better and brighter Christmas. Haynes took away a 32-inch Sony Bravia flat screen television and a W-780 Sony Ericsson mobile handset, while Harry and Jackson received EC$1000 each. âI feel excited because it is the first time I ever won anything,â Haynes said. The overjoyed trucker said that he currently owns two other Sony televisions but this one beats them all. âI like Digicel because they do a lot for the public and since they came in the rates are so much better and I admire that,â Haynes said. By winning this week, Haynes automatically enters into Digicelâs latest promotions; âLive free with Digicel: Making your wishes come troughâ and says he also looks forward to better rates from Digicel for the New Year. Haynes gained his winnings after he topped up with a $25 phone card. Harry and Jackson got lucky when they topped up with a $10 phone card and they both expressed feeling âgoodâ about winning. âFirst of all, I want to give God thanks because I am a Christian and I am grateful to have won this money,â Harry, who is employed as an Office Attendant with Sprotts Brothers Ltd, said. A Photographer by profession, Jackson was on the other side of the camera looking in when he collected his money. âI must feel good because after all, itâs a $1000,â Jackson said, as he made it clear he was a Digicel customer since the company started business here. Digicelâs Marketing Manager, Juno DeRoche, handed over the electronic equipment, while Marketing Executive Edmund Joachim presented the money. Digicelâs promotion, Live free with Digicel: Making your wishes come through, provides for its customers who top up $25 or more, purchase new handsets and keep their postpaid accounts up to date, to be entered into a draw to win $5000, $2500 or $1000 monthly for a year. Also, persons who purchase scratch cards that spell the word FREE, become instant winners of $5000 while there are also scratch cards with the letters F, R or E on the market. Persons who collect these letters and spell F-R-E-E win an instant $1000 and are eligible for the main draw as well as consolation prizes. âTop up $10 or more and have the chance to win prizes which include $1000, television sets, DVD players, handsets, game systems, stereos, Ipods and other items,â DeRoche said. The Live free promotion ends on January 18 while the draw for the Live Free for a year Campaign will be done on January 23. The top up $10 or more to win EC$1000 promotion will run indefinitely.